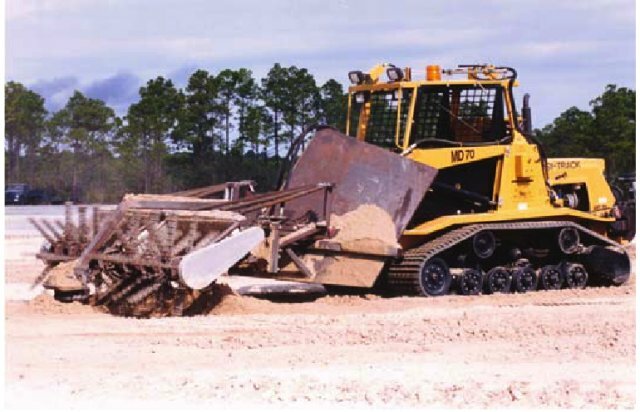 The All-purpose Remote Transport System [ARTS] is a kevlar-tracked, remote-controlled 3.5-ton loader. Various tools can be attached to the platform, transforming it into a forklift, a backhoe, a UXO clearance vehicle for post-attack airfield recovery, or a vehicle used for deploying several specialized EOD tools supporting force protection responses. 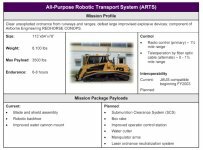 The initial acquisition approach for ARTS included three unusual and compelling procurements of AFRL prototype-based systems. 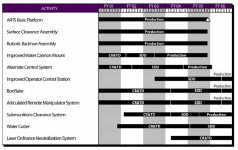 This procurement was followed by a competitive build-to-print acquisition using the Government-furnished POSI-TRACK. 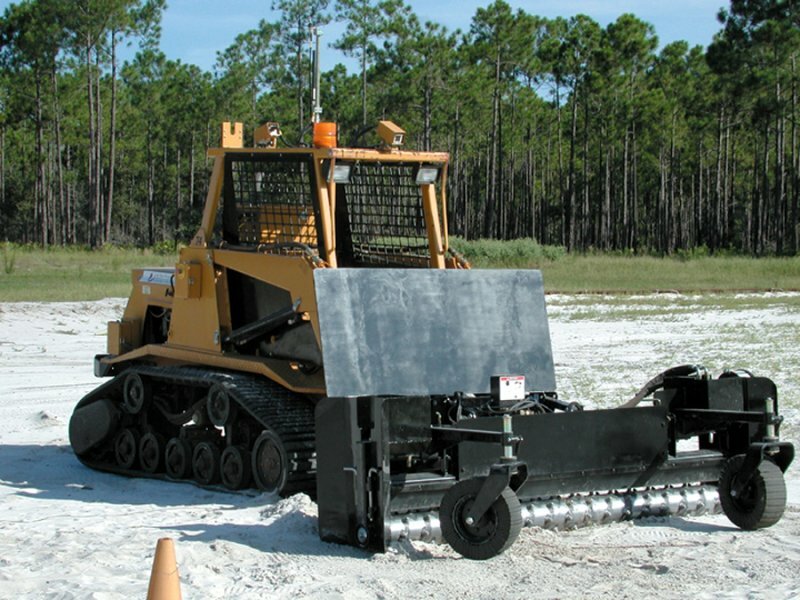 MD-70 with rubber tracks, modified to include a robotics control package designed by the AFRL Robotics Group. Through FY2003, these efforts resulted in the fielding of 46 operational ARTS and 2 units acquired for test purposes. The current acquisition approach, reflected in the June 2002 contract award, converted from the build-to-print philosophy to a performance-based concept with the production of 30 additional ARTS platforms and attachments. Enhancements included in the new production units will be incorporated in fielded units using a limited fleet retrofit program. ARTS full operational capability will be reached in late FY2005 with the fielding of 72 ARTS. The ARTS uses a commercially available medium-sized platform with an Air Force Research Laboratory (AFRL) developed modular teleoperated control system that enables remote operations up to 3 miles line-of-sight. AFRL has also developed several remotely controlled tools that allow an operator to remain at a safe stand-off distance from suspect UXOs and/or IEDs. These include a frangible blade assembly to clear paths so EOD personnel can safely travel to dispose of the UXO. An articulated manipulator attachment which enables an operator to investigate large suspicious packages, recover, and dismantle UXOs. A water cutting tool cuts into and through all types of explosive ordnance, a 90mm water cannon, and a charge setter which provides EOD personnel with stand-off to render UXOs safe. 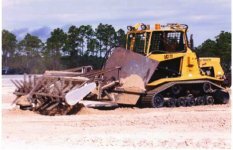 ARTS consists of two components: the operator control unit (OCU) and a modified version of a standard light construction tractor, the Posi-TrackT MD70, manufactured and distributed by All Season Vehicle, Inc. Both components are shipped as a single unit. The vehicle platform has a four-cylinder, liquid-cooled diesel engine that delivers power to the 18 in. wide, Kevlar-reinforced rubber tracks through a dual hydrostatic transmission. The tracks have over 3,000 sq in. of contact area, resulting in ground contact pressure of approximately 2 psi. This vehicle profile allows for a low center of gravity and light footprint, which makes it rugged, reliable, and the perfect candidate for range operations because it minimizes forces that could detonate sensitive munitions. The robotics control package enables remote operation of all tractor functions. The standard configuration includes provisions for four fixed video cameras. A pair of digital radios transmit command signals from the operator control unit (OCU), which resides a safe distance from dangerous operations, to the vehicle. An independent transmitter/receiver pair communicates audio and video from the vehicle to the OCU. Following the tragic incident at Khobar Towers in June 1996, Air Force officials identified a need for the ability to safely remove or disable terrorist bombs. Systems used at this time were too small to remove these improvised explosive devices or disable weapons of mass destruction in such incidents, so the directorate 's Airbase Technologies Division began working on alternatives. 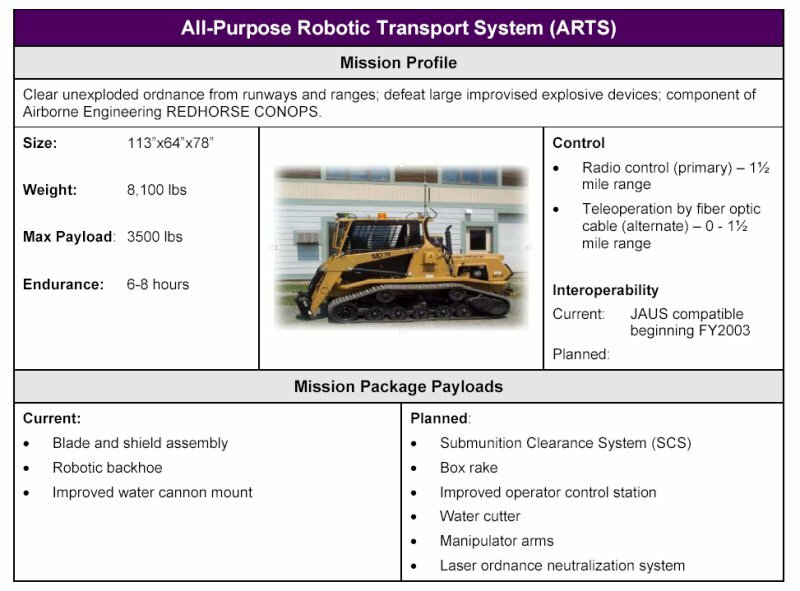 The division 's Robotics Research Group,part of the Office of the Secretary of Defense Joint Robotics program, coordinates the Air Force effort to develop robotic technologies and systems that provide land forces with highly mobile, multi-mission, unmanned ground vehicles to achieve leap-ahead capabilities across a wide spectrum of mission challenges. With the support of a contract team, the directorate immediately sought to develop technology to respond to these critical real-world situations. The Air Force has seen significant success for ARTS, as explosive ordnance disposal (EOD) specialists have used it for unexploded ordnance clearance and remediation.The Air Force currently operates several active bombing ranges where pilots train by dropping advanced and lethal anti-armor/anti- personnel weapons. 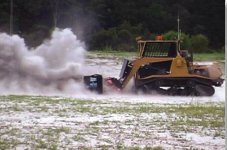 EOD specialists must periodically clear debris such as bomb fragments, unexploded munitions,and other hazardous items. The All-purpose Remote Transport System (ARTS), developed in cooperation with Headquarters Air Combat Command and the 99th Civil Engineering Group, Nevada Test Ranges, already established its value during range clearance operations and demonstrates great potential in force protection, fire fighting, natural disaster cleanup, foul weather operations, range remediation, and active range clearance. ARTS units were forward deployed in direct support of Operation IRAQI FREEDOM. The Airbase Technologies Division Robotics Research Group, part of the Office of the Secretary of Defense Joint Robotics program, coordinates the Air Force effort to develop robotic technologies and systems that provide land forces with highly mobile, multi-mission, unmanned ground vehicles to achieve leap-ahead capabilities across a wide spectrum of mission challenges.